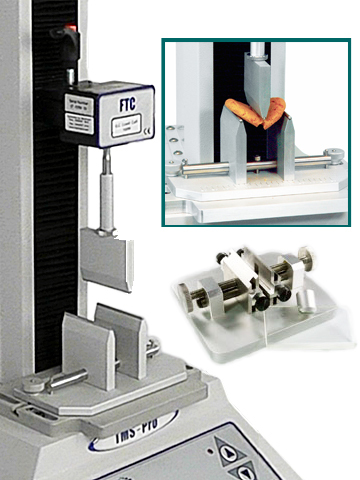 Food snap, bend and break test methods used for hard or brittle, products that fracture, though some softer items are tested this way, where a degree of flexure is expected. Products are typically solids with a homogeneous structure and most conveniently the sample is in a bar-type of shape. Usually the sample is stressed until it breaks and the peak or maximum force is measured but sometimes the amount of movement it will absorb before it gives way is also of interest. The most common set up for this type of test is referred to as a “3 point bend”. The product is supported by 2 “fulcrums” (or anvils) on either side, and a third, centrally aligned, fulcrum (probe) comes down to apply the bending force. The distance between the two side fulcrums is adjustable to accommodate different sized samples. 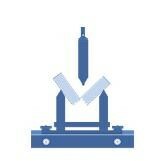 FTC offers several variations of the 3 point bend apparatus to allow testing very fragile to very hard products. FTC offers a specific snapping fixture for spaghetti, which applies a cantilever bend to the pasta product. The TMS friable food support is available for snap and penetration testing of small brittle, crumbly, samples such as crackers.